All credit for this beautiful recipe goes to B. Britnell – this is the first recipe i have personally made from her website but it’s made me keen for more! Thank you B. 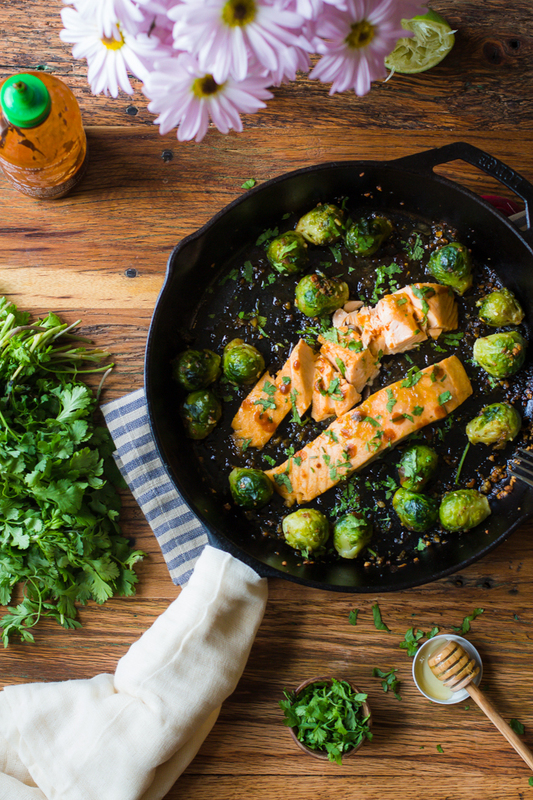 Today we’re talking about this healthy and delicious dinner of Sriracha & Lime Salmon w/ Garlic Roasted Brussel Sprouts. Disclaimer: there might have been quite a few more sprouts before I started taking pictures but I couldn’t stop eating them! Ooops. My favorite thing about this dish is that it requires the smallest amount of effort. The hardest part is mincing the garlic and from there you just throw everything in a skillet. Easy peasy lemon squeezy. But not lemon…we’re using lime. When cooking fish at home, salmon is usually my go to. Unfortunately, I don’t live in an area where fresh fish is seen very often so I most often buy it frozen. So, that’s what we have here. Since the brussel sprouts take longer to cook, those go in first with the garlic to saute for a few minutes. After the sprouts have cooked for about 8 minutes, take them off of the heat and set aside. In a small bowl, combine honey, lime juice & zest, sriracha sauce, and salt. Taking each piece of salmon individually, dip it into the sauce so that it is covered on each side. Place the salmon in the middle of the skillet. Once the salmon is placed, pour the remainder of the sauce over top of the 2 pieces of salmon. The juices will spread throughout the pan which is okay. The brussel sprouts will soak up the extra sauce and make them extra yummmmmyyy. Bake in the oven for about 15 minutes. When I first made this dish, I didn’t anticipate how much the brussel sprouts would also be flavored by the sriracha and lime juice. The honey causes it to kind of caramelize around the veggies and make them extra delicious. It’s all topped with a good handful of cilantro and eaten right out of the skillet for maximum flavor consumption. In a large skillet, heat the oil and butter over medium heat and add in the brussel sprouts and garlic. Saute for 7-8 minutes and then take the skillet off of the heat. In a small bowl combine the honey, lime juice & zest, sriracha sauce, and salt. Once the salmon is placed, pour the remainder of the sauce over top of the 2 pieces of salmon. The juices will spread throughout the pan which is okay. Top with cilantro and extra lime juice and ENJOY!! This entry was posted in Uncategorized by thekensingtonstudio. Bookmark the permalink.